City management, Toronto Counter Human Trafficking Network, police, human trafficking survivors, community agencies from multiple sectors will gather on the 28th and 29th of October, 2013 for the first in a series of roundtables “Building Collaboration to Combat Human Trafficking in the City of Toronto”. 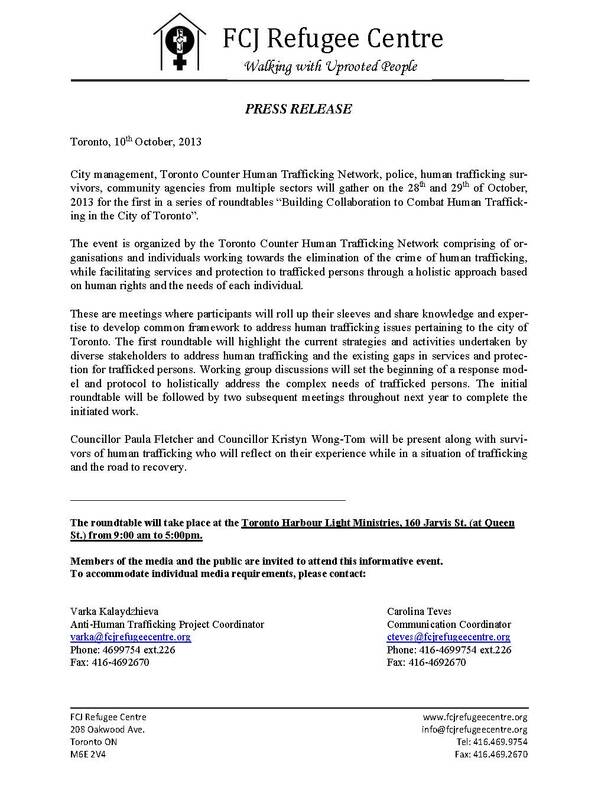 The event is organized by the Toronto Counter Human Trafficking Network comprising of organisations and individuals working towards the elimination of the crime of human trafficking, while facilitating services and protection to trafficked persons through a holistic approach based on human rights and the needs of each individual. These are meetings where participants will roll up their sleeves and share knowledge and expertise to develop common framework to address human trafficking issues pertaining to the city of Toronto. The first roundtable will highlight the current strategies and activities undertaken by diverse stakeholders to address human trafficking and the existing gaps in services and protection for trafficked persons. Working group discussions will set the beginning of a response model and protocol to holistically address the complex needs of trafficked persons. The initial roundtable will be followed by two subsequent meetings throughout next year to complete the initiated work. Councillor Paula Fletcher and Councillor Kristyn Wong-Tom will be present along with survivors of human trafficking who will reflect on their experience while in a situation of trafficking and the road to recovery. The roundtable will take place at the Toronto Harbour Light Ministries, 160 Jarvis St. (at Queen St.) from 9:00 am to 5:00pm. Members of the media and the public are invited to attend this informative event.